Tyler Cavener celebrates his two-run single in the eighth inning with first base coach Josh Neufeld. 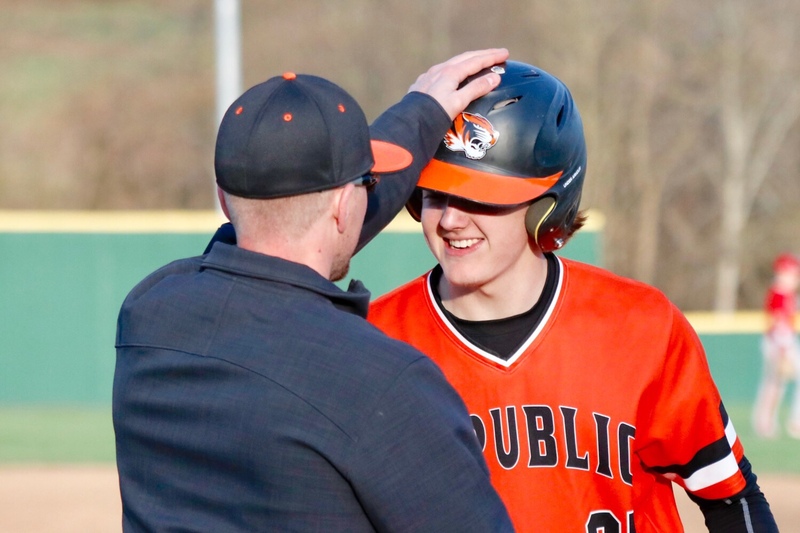 Tyler Cavener went 4-for-4 with three RBIs, including the game-winning hit in extra innings, to help Republic end a decade of frustration with a 6-4 win over Ozark. After losing a 4-0 lead and narrowly escaping an Ozark threat in the bottom of the 7th, Republic scored its game-winning runs with a two-out rally in the eighth. The extra-innings victory flipped the script from many of Republic’s recent close games, where late mistakes had cost the Tigers down the stretch. 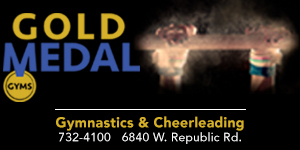 This time, Republic lost a late lead but battled back to regain the momentum and pull out the win. It’s the first time Republic has beaten Ozark since head coach Curt Plotner came to Republic a decade ago as an assistant. Republic broke on top 1-0 in the first inning when Cavener singled home Jaden Duvall. In the top of the fourth, a single by Kyle Hill and a walk to Vincent Pyeatt set up an RBI double by Clayton Crowley. When Duvall struck out but reached base on a wild pitch and a throwing error by the catcher, Pyeatt and Crowley both scored to make it 4-0. It could have been more, but Ozark gunned out Duvall at home plate. Ozark cut the lead in half in the bottom of the fourth, and Republic had another chance to extend its lead in the top of the fifth, but left two runners on base. In the fifth, Ozark left the bases loaded as Pyeatt, who entered the game in relief after a strong start by Jared Hughes, worked out of a jam. A leadoff error and two walks loaded the bases for Ozark, but a fly out to shallow right field and a groundout ended the threat. In the sixth, Ozark tied the game with a two-out, bases-loaded single. Then in the bottom of the seventh, Ozark seemed poised to deliver another disappointing loss to Republic. After a leadoff error, Ozark had a runner on third base with one out, but Pyeatt coaxed a pop up to third baseman Nick Rose, then struck out a batter to retire the side. Even Republic’s game-winning rally was a lesson in overcoming frustration. After a leadoff single, the Tigers lost a runner trying to advance to second base on a pitch in the dirt. But with two outs and nobody on base, Clayton Crowley, Jaden Duvall, and Easton Prevo all singled to load the bases, setting the table for Cavener. Cavener quickly found himself in the hole with two strikes, but he fouled off three more pitches and worked the count to 2-2 before guiding a ball into the hole on the left side of the infield for a two-run single. Crowley scored easily and Duvall slid in just ahead of the tag to give Republic a two-run lead. In the bottom of the eighth inning, Pyeatt again worked around a leadoff error. He struck out the next batter for the first out. Prevo made a difficult over-the-shoulder catch running away from the infield in foul territory down the third base line for the second out, and Jaden Duvall caught a fly ball in center field to end the game. In addition to Cavener’s four-hit performance, Hill added two base hits and a walk, and Crowley was 3-for-3 with two doubles and a walk. Duvall had a hit and a walk and scored two runs. Hughes pitched five innings, allowing two runs (one earned) on three hits. He struck out six and walked three. Pyeatt picked up the win with three innings of relief work, striking out two, walking two, and allowing two hits. Republic improves to 3-4 with its second consecutive win.